This one feels like a bit of a re-announcement but over time could well amount to more. Chip maker Intel and handset maker Nokia held a joint press call today to tell the world about a new “long term relationship” to share R&D and key technologies to develop a new mobile platform or range of devices that “go beyond today’s smartphones, notebooks and netbooks”. Oh and said devices will be powered by future Intel processors, of course. Which, as The Register points out, sounds a lot like the Mobile Internet Devices (MIDs) Intel has been to touting for years, and very similar to Nokia’s own – albeit non-Intel based – N810 Internet tablet (see my review). See also: Should Nokia release a Netbook? Both companies are already investing heavily in their own Linux-based mobile operating systems and this will continue. 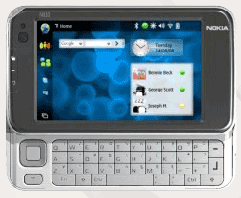 Intel will carry on working on the development of Moblin, designed to run on Netbooks and MIDs, and Nokia will keep plugging away at Maemo, which currently powers the N810 and is also being pitched as a Plan B for Nokia should its open sourcing of Symbian OS not bear the fruits that the company hopes for. This despite both companies talking up their partnership as a way of consolidating their open source efforts. As a side note, Intel is of course a major partner for Apple and one would presume that the company had been hopeful that sometime in the future it could persuade the iPhone maker to put ‘Intel inside’ its future phones. That ambition may have now been squashed upon recent news that Cupertino has been busily recruiting its own chip-designing team.